The world’s most advanced prosthetic hand is an incredible device that can not only help an amputee feel more comfortable; it can perform advanced functions that no other prosthetic limb has ever been able to do. Actions like typing, clicking a mouse, breaking eggs, and even writing with a pen are possible with the bebionic3 arm. The bebionic3 is a myoelectric robotic arm that can function in a lot of the same ways a natural hand can do. In the above video, Nigel Ackland demonstrates his bebionic hand which he received after a work accident claimed his hand. The robotic limb is capable of 14 different positions which give its owner a wide range of functions. Because the hand is controlled by the user’s own muscle impulses, it works almost like a natural hand. 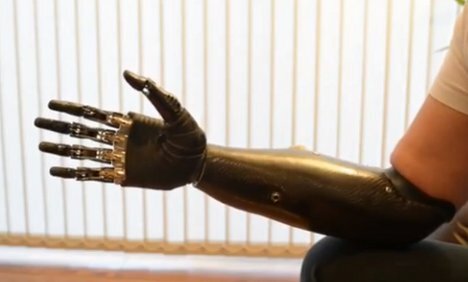 It comes with a flesh-toned glove that can be worn to simulate the appearance of a natural hand, but we think it looks much cooler in all its metallic robotic glory.